At least 44 people have been killed in the violence, including 18 civilians, according to AFP. Separately, a Saudi border guard has reportedly been killed by gunfire.It is the first known Saudi fatality since it began an air campaign against the Houthis last week. The Saudi government says the aim of its operation in Yemen is to protect President Abdrabbuh Mansour Hadi’s “legitimate government”. It says it has no plans to deploy ground forces for now. 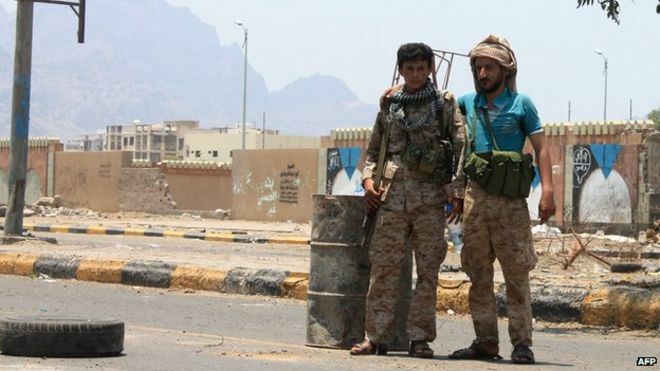 Aden was President Hadi’s last seat of power before he fled to Saudi Arabia last week, as the Shia rebels advanced on the city. “There are bodies and wounded in the streets and nobody dares to approach,” said a resident in the central neighbourhood of Crater.